Home › Advertising › Is This the Best Print Ad Ever? Is This the Best Print Ad Ever? So the title is a very bold question. Once you take a look at the ad, you may question my competence. Is this the best ad of all time? Quite confidently, I can say it’s not. However, I’ve carried it around with me forever and used it as a discussion vehicle for a long time. What I like about it is that we can learn from the simplicity and the techniques used to promote the product. This ad ran mostly in the magazine in Sunday papers. It’s from a time where (believe it or not) not every house was wired for cable television and many folks had antennas which tapped into signals from their local television stations. 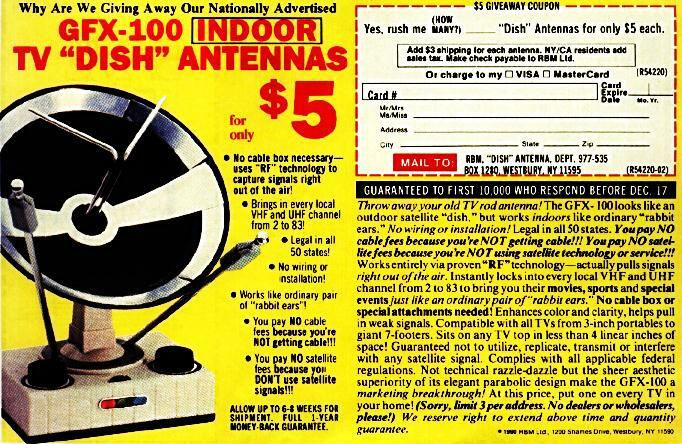 Most televisions of the time came with a pair of “rabbit ears” for those without a rooftop antenna. Sell the core benefits of your product. Face it; the GFX-100 is not a product with huge benefits. However, the ad proudly expounds them and somehow features additional ones that sound valuable. “Actually pulls signals right out of the air!” So does a coat hanger, but they don’t need to point that out. “You pay NO cable fees because you’re not getting cable!” You aren’t getting the clarity or selection of cable either, but not paying fees is turned into a benefit. It’s also “Legal in All 50 States!” Good to know. Be honest and straightforward with your audience. Most people I’ve shown this ad to say something like “Well, they’re just selling a piece of crap!” Yes they are, and they tell you exactly that. They follow the pulls signals line with the emphasis “just like an ordinary pair of rabbit ears!” They also point out that it is a “marketing breakthrough!” I guess because it certainly isn’t a technical breakthrough. I challenge you to find any claim in the ad that isn’t 100% true. Use the visual tools available to enhance the copy. This ad uses rudimentary tools to enhance the copy. They employ bullets, italics, bolding and the all important exclamation point to emphasize things and make statements pop out from the copy. It’s actually pretty effective! Today’s palette of tools to enhance copy, both in print and online, is huge compared to what existed in the time of this ad. Have I convinced you yet? There is some learning here. Also, before you ask, I did not order this product and won’t be searching eBay for an original. If you Google the product, you’ll find a number of web pages dedicated to it. The product is gone (it wouldn’t work today anyway) but not forgotten. ‹ Content is King in Today’s Marketing: 3 Easy Steps to Hail The King! In item number 1 above Eric points out, ““Actually pulls signals right out of the air!” So does a coat hanger”! Which reminds me that I assembled an HDTV antenna using 6 coat hangers and it works like a charm! Thanks for the good, fun stuff Eric! Thanks, Steve. The big question on everyone’s mind is was there also duct tape involved in that project?